Selling your watch to WRIST ICONS couldn’t be more simple and straightforward. We offer highly competitive quotes, as well as a quick and hassle-free service—just fill in your details in the form to get started. What’s more, you can use your old iconic watch as a part trade , and as we offer a vast selection of pre-owned timepieces from over the well know luxury brands, you’re sure to find exactly what you’re looking for. You can also drop by and visit us at our office, where our experts will be on hand to answer any queries you may have. To schedule a DHL pick-up, call +31634141572. Still have questions about how to ship your watch? For clients in the EU, we offer a sale-on-commission service for your watch, called consignment. Our fee is determined by negotiation, but rarely higher than 25%, dropping to below 10% for pieces of higher value. Schedule a free in-home pickup. Ship your items directly with a free, prepaid label. Visit the WRIST ICONS Office for a free valuation and consignment drop-off. Our team watchmakers and authenticators, carefully evaluates every item. We authenticate, photograph, price and sell your items fast. Get to know our experts. Once your item sells, choose to be paid by direct deposit, site credit (Learn more about our commission rate structure. WHY SHOULD YOU CONSIGN WITH WRIST ICONS ? We may offer to purchase your watch outright, rather than consign it. - If we consign it, naturally the higher the value of your watch, the lower our percentage commission. This starts with watch values of circa €20,000 and above. - With large physical overheads, traditional retailers and auction houses, are restricted in their competitivity. As an online business, we can price your watch for liquidity, but you still make a better return. - In the digital market, we have a worldwide reach and a strong social-media presence. 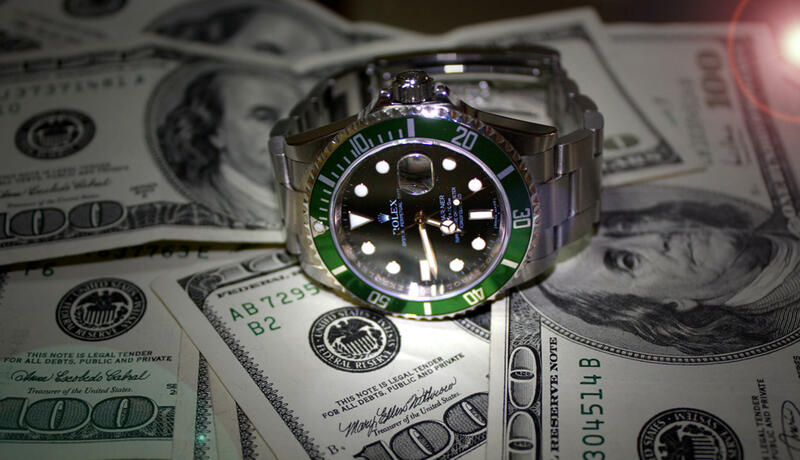 - All watches are fully insured whilst in our custody. - The average time-frame between consignment and sale, is eight weeks. Naturally there are exceptions, and if after three months, your watch still hasn't sold, you may request its return, at our expense. - We guarantee the authenticity of a watch for life and give a 24-month warranty on all our watches after sale, so quality-control is very important to us. - We can arrange for servicing or valeting of your watch, if either is appropriate, before listing. We will discuss this with you before agreeing to the consignment. - We transfer the proceeds of sale to you, on the 11th working day after we've received them. Once a price has been agreed upon, we will photograph, document, and style your watch and then present in on the WRIST ICONS webshop. We will reach our custiomers through our social media audience. We can offer two options. Firstly a consignment sale whereby we do all the work on your behalf and return the proceeds of a sale to you less a modest commission. Alternatively we can offer a cash purchase which is quick and simple but would generally return 20-30% less than a consignment option. Your choice. Consignor makes the Property available to WRIST ICONS on a consignment basis. WRIST ICONS accepts the Property from Consignor on a consignment basis only. All risk of loss or damage of the Property will pass to WRIST ICONS when the Property is in WRIST ICONS physical possession. Consignor retains all risk of loss or damage to the Property while the Property is in transit; provided, however, that if Consignor uses WRIST ICONS approved method of shipment to WRIST ICONS (using WRIST ICONS label and its integrated DHL shipping arrangement), then WRIST ICONS will insure or arrange for a third party to insure the Property against loss or damage in transit, up to the sale price. As used herein, a "shipment" means items of Property shipped together under one bill of lading. Subject to the foregoing, WRIST ICONS shall insure the Property in such amounts and against such risks as to which such goods are customarily insured, including insurance for theft and damage, and shall provide evidence of such insurance coverage to WRIST ICONS as and when requested. If the Property is damaged or lost while in WRIST ICONS physical possession, a Property Sale will be deemed to have occurred and WRIST ICONS will reimburse Consignor in the amount of the Consignor’s Commission (defined below), based on the damaged or lost Property's net selling price(s), as determined solely by WRIST ICONS. This remedy shall constitute the sole remedy and entire recourse of Consignor against WRIST ICONS and is in lieu of any other remedy available as a matter of law or equity. WRIST ICONS only accepts clean items in very good to excellent condition. Upon receipt, WRIST ICONS will evaluate the Property to determine its authenticity and quality. Condition issues may affect the value of the item. Items of Property that do not meet WRIST ICONS authenticity or quality standards, or are not included in the Designer Directory (see WRIST ICONS website at www.wristicons.com for currently accepted Property), will not be accepted and will be returned to Consignor at Consignor’s expense (see "Return of Property" below). Consignor will not provide counterfeit items for consignment. In the event WRIST ICONS believes that any item of the Property offered or provided to it is counterfeit, WRIST ICONS shall either refuse to take possession of such item, or to the extent WRIST ICONS has taken possession of such item, WRIST ICONS shall notify Consignor that it believes the item is counterfeit and, subject to applicable statute and government laws regarding the shipment of counterfeit goods, provide Consignor a reasonable opportunity to retrieve such item from WRIST ICONS. If Consignor does not retrieve such item from WRIST ICONS within 120 days from the date of such notice, then WRIST ICONS shall be entitled to treat such item as abandoned. Consignor acknowledges and agrees that it is WRIST ICONS policy that a consignor’s personal and business information may be requested by rights owners looking to trace the origin of counterfeit items. In the event of any such request WRIST ICONS may provide such information in its sole discretion. The "Consignment Period" for an item of Property shall begin on the date the Property is received by WRIST ICONS and shall end 180 days after acknowledgment of receipt. The Consignment Period may be extended upon mutual consent of both parties. After the Consignment Period, Consignor may request return of the Property. Return shipping expenses shall be paid by Consignor and WRIST ICONS shall have no obligation to return such items unless and until Consignor has provided for shipping at its sole expense. Upon acceptance of the Property, WRIST ICONS will display and make commercially reasonable efforts to sell the Property. Consignor acknowledges that WRIST ICONS will designate the product category applicable to the Property. The initial selling price for the Property will be mutually set by WRIST ICONS and customer in writing, and WRIST ICONS will not change the price without first obtaining customers prior written approval. WRIST ICONS reserves the right to run promotions on its website and by other means and to offer discounts to its customers at its sole discretion. Consignor acknowledges and agrees that items of its Property consigned hereunder may be advertised, displayed and sold with items belonging to other consignors. On the sale of any item of Property, Consignor will receive the following Commission (as defined below). The following ranges below are "Net received funds". For example, if a transaction occurs with a sale price of €10,125, and we receive €9,821 "Net" after credit card fees, the commission rate will be 27%. The Commission rates will reset at the Termination Date. WRIST ICONS may at its sole discretion temporarily increase the Commission from time to time for promotional reasons. The difference between the net selling price and the amount paid to WRIST ICONS (the "Commission") shall be Consignor’s sole compensation under this Agreement. "NET SELLING PRICE" means the net revenue actually received from Direct or Indirect Sales of a product, less (a) any and all service and restoration fees, credit card, paypal, or other third party transaction or banking fees, normal and customary rebates, and cash and trade discounts; (b) sales, use and/or other excise taxes or duties; (c) insurance costs and outbound transportation charges; (d) import and/or export duties; and (e) amounts allowed or credited due to returns (not to exceed the original billing or invoice amount). The net selling price reflects all applicable sales commissions, stylist referral fees, promotions and other discounts applied directly to or associated with the sold item. WRIST ICONS issues payment for Commissions on the 15th day of every month for a sale period beginning on the 1st of the previous month to the last day of the previous month. For example, payments issued on April 15th would cover the sale period from March 1 through March 31. In the event of any dispute between the Parties, WRIST ICONS shall have no obligation to pay any Commission or other amount otherwise due to Consignor, including without limitation amounts unrelated to the dispute, unless and until such dispute is resolved. WRIST ICONS shall be entitled to withhold any Commissions (including any otherwise due) in full or partial satisfaction of any amounts due to WRIST ICONS. At any time during the Consignment Period, Consignor may require the immediate removal of all or some of the Property from WRIST ICONS service, with reasonable written notice to WRIST ICONS. All costs of removing and returning the Property will be borne by Consignor and WRIST ICONS shall have no obligation to return such items unless and until Consignor has provided for shipping at its sole expense. Additionally, if Consignor requests the return of Property prior to the end of the Consignment Period, there will be a fee of €700 per piece, plus any additional third party costs incurred to restore or repair the property, plus €75 per item for any other Property to cover WRIST ICONS costs of storing, cataloging and photographing the Property, and Consignor will be responsible for shipping costs to and from WRIST ICONS. In addition to the one-year expiration first referred to above, either Party may terminate this Agreement at any time, for any reason. Termination shall be effective when either Party serves written notice thereof on the other Party. Costs listed above under "Return of Property" will apply. Neither Party may assign this Agreement or any interest herein without the other Party’s express prior written consent, except that WRIST ICONS may assign this Agreement without Consignor’s consent in connection with any corporate transaction such as a merger or acquisition. Consignor acknowledges and agrees that these terms may be changed by notice posted on WRIST ICONS web page at www.wristcons.com/service/sell-or-consign WRIST ICONS will use reasonable efforts to communicate any such changes to Consignor (such as sending notice to an email address provided by Consignor), but WRIST ICONS cannot guarantee that Consignor will receive such notices, or receive them in a timely manner. WRIST ICONS shall not offer any warranties on any item of Property, except to the extent a warranty is required by law and cannot be disclaimed. Consignor hereby warrants that it has good and marketable title to each item of Property, none of which is subject to any liens or other encumbrances, and further represents and warrants that the Property does not infringe upon or violate any trademark, copyright, or other proprietary right of any third party, any government law, or any administrative regulation. Consignor hereby agrees to indemnify and hold WRIST ICONS harmless from all damages, suits, litigation, awards, and costs, including but not limited to attorneys’ fees and costs, that may arise out of WRIST ICONS display or sale of the Property for any reason whatsoever, including but not limited to civil or criminal suits over authenticity, legality, ownership, infringement of copyright or trademark, or any other claim or litigation. WRIST ICONS DISCLAIMS ANY AND ALL WARRANTIES, EXPRESS AND IMPLIED, RELATING TO ITS SERVICES OR ACTIVITIES HEREUNDER. IN NO EVENT WILL WRIST ICONS ICONS LIABILITY HEREUNDER EXCEED THE NET AMOUNTS IT HAS ACTUALLY RECEIVED AS A RESULT OF SELLING CONSIGNOR’S PROPERTY HEREUNDER. THE FOREGOING DISCLAIMER AND LIMITATION IS A FUNDAMENTAL PART OF THE BASIS OF WRIST ICONS BARGAIN, AND WRIST ICONS WOULD NOT ENTER INTO THIS AGREEMENT WITHOUT SUCH DISCLAIMER AND LIMITATION. This Agreement shall be governed as to validity, interpretation, construction, effect, and in all other respects by the laws and decisions of the Netherlands, without regards to its conflict-of-law provisions. The Parties hereby irrevocably consent to the jurisdiction of the courts of Amsterdam, the Netherlands with respect to any matter arising under this Agreement. This Agreement sets forth the final, complete and exclusive agreement of the Parties regarding the subject matter hereof, and terminates and supersedes all prior understandings or agreements on the subject matter hereof. This Agreement may be modified only by a writing duly executed by both Parties. Either Party’s failure to insist, in any one or more instances, on strict performance by the other Party of any of the terms of this Agreement shall not be construed as a waiver of any continuing or subsequent failure to perform or delay in performance of any term hereof. If one or more of the provisions of this Agreement shall be declared or held to be invalid, illegal, or unenforceable in any respect in any jurisdiction, the validity, legality, and enforceability of the remaining provisions hereof shall not in any way be affected or impaired thereby and any such declaration or holding shall not invalidate or render unenforceable such provision in any other jurisdiction. IF NOT SOONER TERMINATED AS PROVIDED HEREIN, THIS AGREEMENT WILL TERMINATE AUTOMATICALLY ON THE FINAL DAY OF THE MONTH THAT IS ONE YEAR FROM THE DATE OF THE FIRST PROPERTY SALE TO OCCUR UNDER THIS AGREEMENT (THE "TERMINATION DATE").